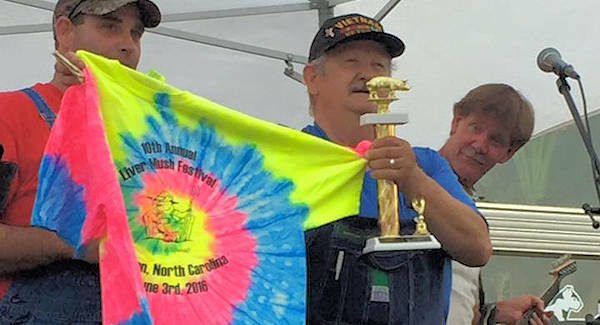 The Liver Mush Festival celebrates the local favorite food and its heritage in western North Carolina. 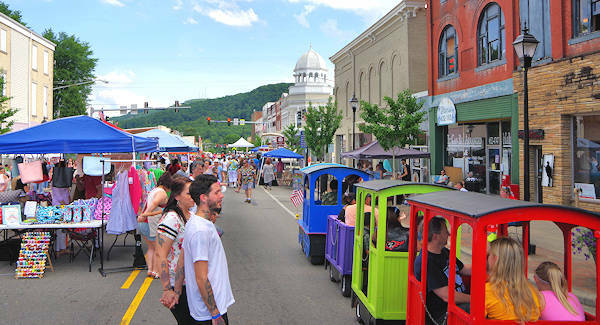 It is held 5-9 PM in downtown Marion, just 35 miles from Asheville. 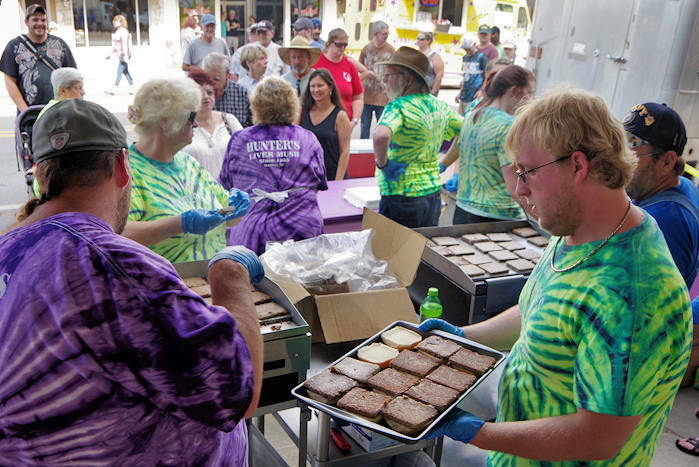 The historic Main Street is filled with a variety of vendors, a long line for the coveted liver mush sandwich, hog calling and cheers for the liver mush eating contest. 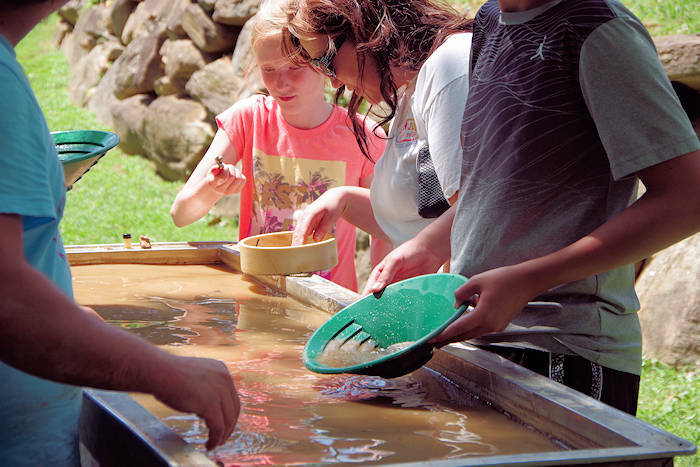 It's one of our Top Summer Festivals & Events. We loved our visit and took these photos. 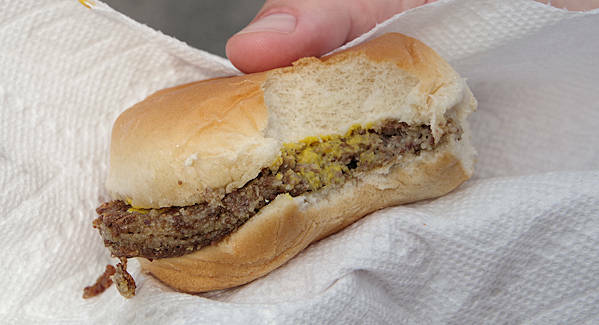 The event includes a free liver mush sandwich to the first 1,500 people in line from the generous folks at Hunter's, maker of the local favorite. The line stretched for a full city block, so I'm glad we got there early before they ran out. Locals gave us some advice on condiments (mustard is best) and how they like fried liver mush even better. 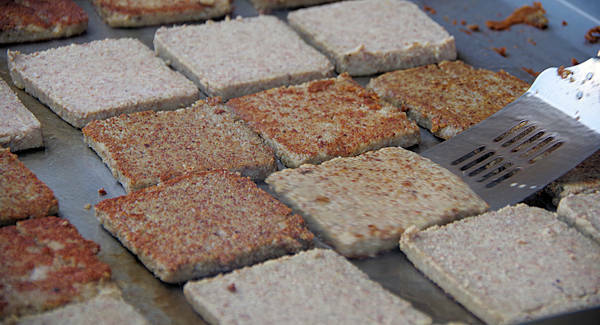 This longtime southern favorite is composed of pig liver and other parts mixed with cornmeal. It is spiced with pepper and sage, so it's a similar taste to sausage. Hunter's Liver Mush is made in Marion. Typically, it comes in a loaf, then you slice off some for a sandwich, often after it is fried. It is popular as a breakfast meat, served with eggs and grits. There's more than livermush! Downtown restaurants and food trucks will offer a big variety of food. Try local craft beers at the Refinery 13 Taproom brewery at 13 N. Main. Burrito Brothers is next door at 9 N. Main. Spillway Bridge (93 S Main St) music venue and taproom has 20 beers on rotation. Mica Town Brewing is located at 25 Brown Drive - just off Main. 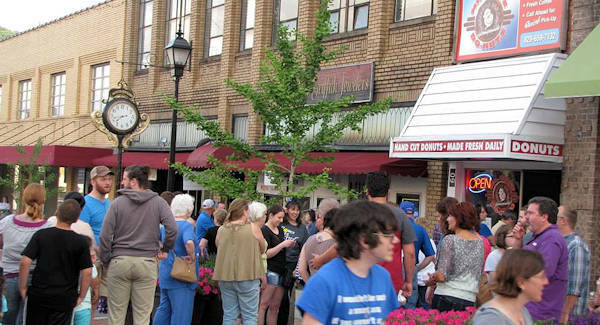 Find a big variety of local vendors with art, clothing and many hog-related items. There's also a kids' area with face painting, balloon making and inflatables for play. 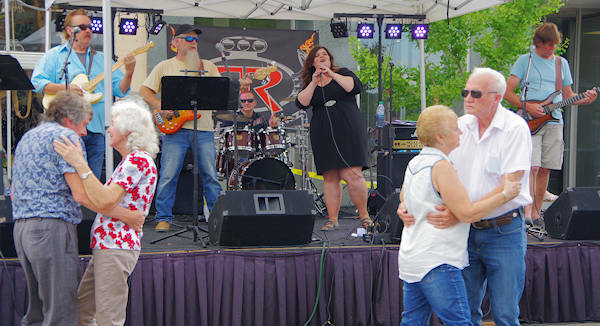 You can dance off your calories to live music! For dessert, stop by Mr. Donuts (go early, they often sell-out). 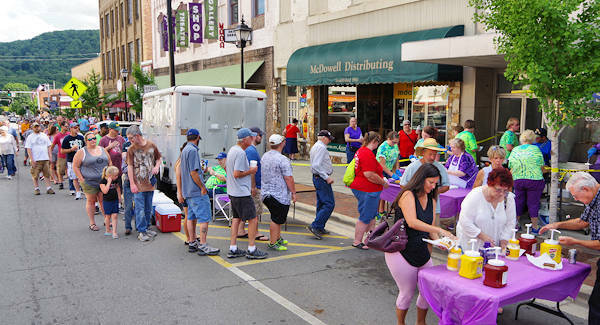 Food trucks and booths offer ice cream, kettlecorn, smoothies and other sweet treats. 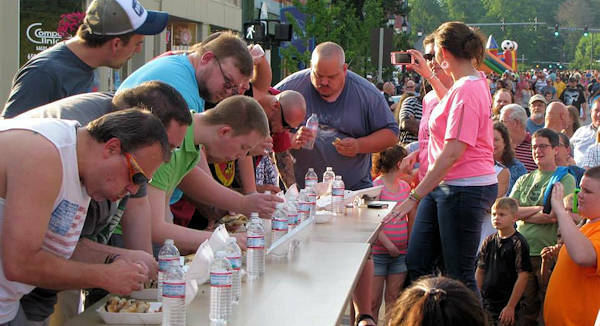 The crowd favorite event is the livermush eating contest at 7 PM. Take on the defending Hog Calling Champion, 6 PM. 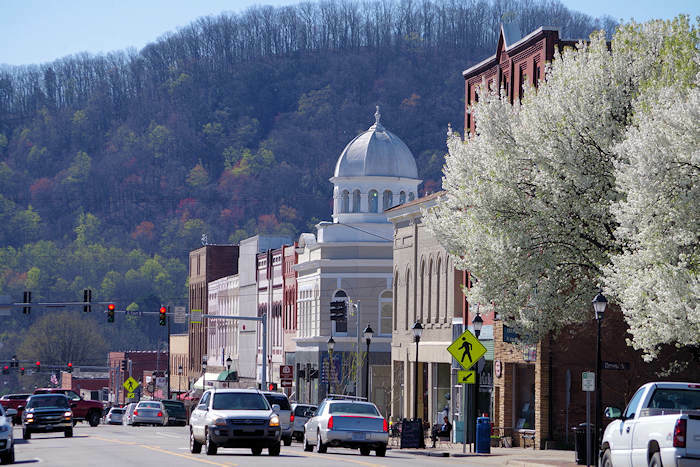 For more information about the festival, call 828-652-2215. 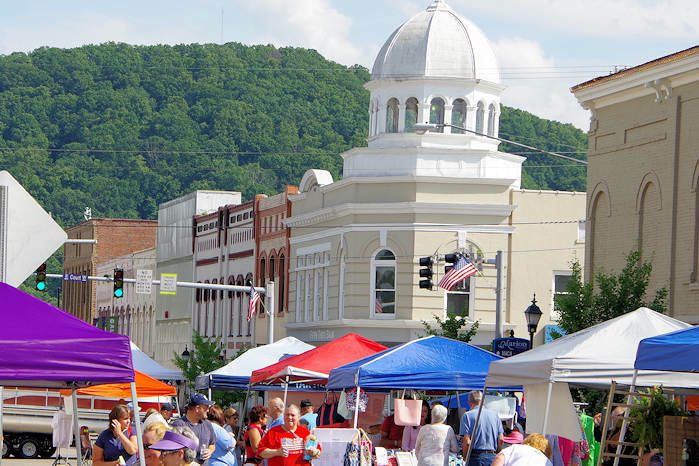 In case of rain, the concert will be at the Historic Marion Tailgate Market cover, 67 West Henderson Street. 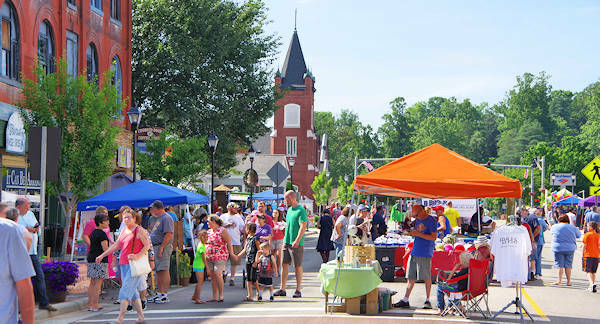 Sweet Treats of the Carolinas Festival in April: Also in downtown Marion, with plenty of sweet, delicious treats and art and crafts to buy from local and regional artisans. Read more. 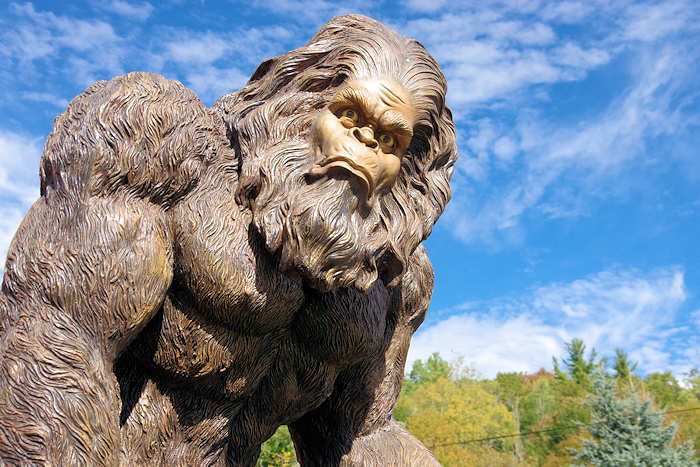 Bigfoot Festival in September: Return to downtown Marion to celebrate the legendary Bigfoot. Read more. Also, see our Top 12 Foodie Favorites.